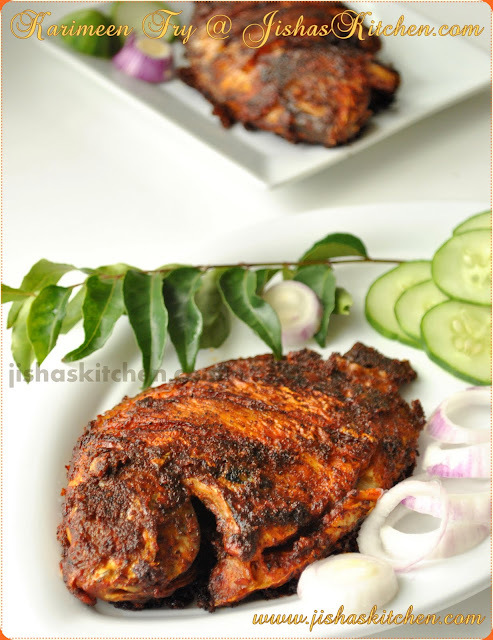 Today I am sharing the recipe of Kerala Fish Biryani / Kerala Meen Biryani. Biryani is a colourful dish made of rice, spices, meat, fish, eggs or even vegetables. The word "Biryani" came from a Persian word "Biryan". This dish was originated in Iran and was bought to India by some Iran travelers and merchants. I never ever miss a chance to attend a Kerala Muslim wedding. Because I just love the biryani, they used to make. Its so aromatic and appetizing that we will be forced to have this dish. The last Muslim wedding I attended, was my classmate's wedding and that too during my college days. :(....I am not saying that I didn't have biryani after that. The biryani that we get in the restaurants over here cant even come close to those which we get in Muslim Weddings back in India. So here comes my recipe. Note: You can fry these either in oil or in ghee. Wash and cut the fish to medium size pieces. Then marinate the fish pieces with 2 tsp chilly powder, 1/4 tsp Turmeric powder and enough salt. Refrigerate it for 15 minutes. Then shallow fry the fish pieces in oil till it becomes light brown in color. Then place the fried fish pieces on a paper towel. Then heat oil in a pan and add chopped onions, green chillies, garlic and ginger. Saute till onions become soft. Then add chopped tomato and fry till tomatoes are nicely done. Then lower the flame and add 2 tsp chilly powder, 3/4 tsp coriander powder, 1 pinch turmeric powder and 1/4 tsp garam masala. and fry for less than a minute. Then add fried fish pieces along with curd,salt and 1/2 cup water. Cook covered for another 5-10 minutes.Then mix coriander leaves and mint leaves and remove from the flame. Note: The gravy should be thick. Wash the rice and drain it nicely. Then heat ghee / oil in a vessel and fry crushed spices for 1 minute, and then add rice and fry for about 6-7 minutes. Then add 4 cups of hot water and salt. Cook covered till the rice is fully cooked and the water is completely absorbed by the rice. Preheat an oven at 400 F.Then grease a big vessel (Oven Safe) and transfer half of the rice to that vessel. Then add some fried onions, fried cashew nuts and raisins. Then spread the fish masala evenly over it. Then again layer the rest of the rice along with e fried onions, fried cashew nuts and fried raisins. Then cover it nicely with a lid or an aluminium foil and keep it in the oven for 10-15 minutes. Or you can even keep it in a very low flame for about 10 minutes. i never had a fish biryani before...this looks very delicious....I am sure it tastes yummy! nice job! Hi Jisha, I am new to your blog. But the pictures says that you have a lot of good stuff here! The biriyani looks delicious! Wow looks too good and yummy.. biriyani i love it..
How are you? I normally read all your recipes without putting a comment, but cant help putting a word of appreciation on this recipe. 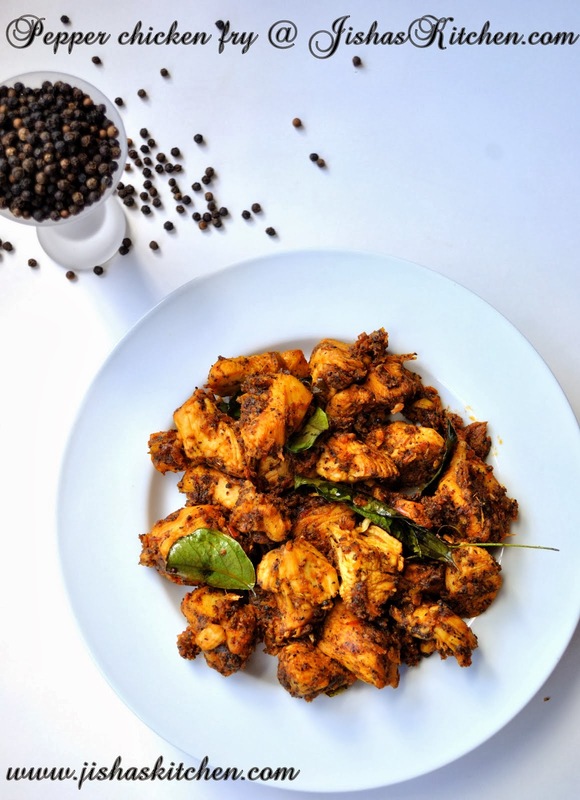 This is an awesome recipe and will try soon, It is bit different from few fish Pulao ( Bong style) that I know. I may not get the specified fish, but will use King fish or some sweet water fish. I dont eat meat and this one is the perfect recipe for me. bookmarked. 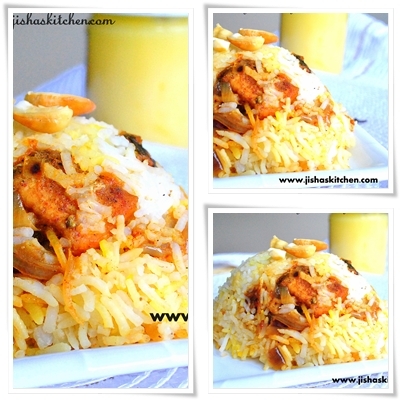 Mouthwatering here, u r just tempting with ur beautiful clicks, truly a delish this biryani is..